Growing up, there was never any question about whether or not I would be able to play softball for my high school. I played co-ed tee ball when I was 8, then graduated to slow-pitch for a community center team in middle school, and finally moved on to fast-pitch at Roosevelt High School. I had my very own uniform with a bright green “22” on the back of my gold-and black-striped jersey and stretchy Kelly green pants. Sure, I didn’t have the nicest mitt in the outfield and sometimes getting to and from practice or games was difficult with two working parents and no car to transport myself. But I never questioned that playing sports was something that would ever be out of reach for me or anybody else. That it was a privilege within itself. Until I heard about Upower. Upower is a nonprofit organization that brings fitness activities, specifically CrossFit, to high school teens in underserved communities. For families living on low incomes, opportunities for physical activity can be few and far between. Not all teens can afford participation in club or varsity sports, so Upower partners agencies that serve youth and local schools with fitness outlets to offer this free afterschool program that focuses on improving physical fitness in a safe environment for youth. This year, a guidance counselor at Roosevelt High School looking to recruit more teens for the program put Jill Beck, co-founder and coach at Upower, in contact with Joanna Tarr, Children’s Advocate for the youth living on our Sand Point Housing Campus. “Being able to work with someone who knows these kids as much as Joanna does enables us to make sure the kids are successful. That’s why the partnership is important,” says Jill. Attendance is mandatory for students and coaches. The experienced fitness coaches – in which there are at least two in every class – act as mentors for the teens, so they’re expected to have a “90% attendance rate, which is the same as the students. When you can’t come to work, you don’t just NOT show up! We’ve established that with our kids. They want to be accountable,” says Jill. When it comes to the instructors, “We expect them to develop those relationships with these kids. When they develop a relationship, talk a little bit of trash back and forth, then that’s great.” Jill earned her spot as a crowd favorite. “Jill was there, always on top of things, making sure you had a goal in the first place. I bonded a lot with Jill,” says Andrea Rodriguez Fabian, 16, one of the Roosevelt students living at Sand Point who participated in the program. Another participant, Deiosha Sparks, 15, says of the coaches, “They don’t let you slack or anything. They make sure you have done something new each day. They let you do what you do best. And you’ll be coming home sore and sweaty but after that day you’ll be like, ‘Wow, did I just do that?’ You feel really good about yourself!” Even Joanna noticed the positive effects of the workouts. “They would come home every day a little sweaty, looking a little tired, but with big smiles on their faces.” Even though school is out for summer, those smiles were still present. Deiosha showing off her fave move: chest to bar pull-ups! “They push you hard to reach your goals, and they try to make it fun, too. 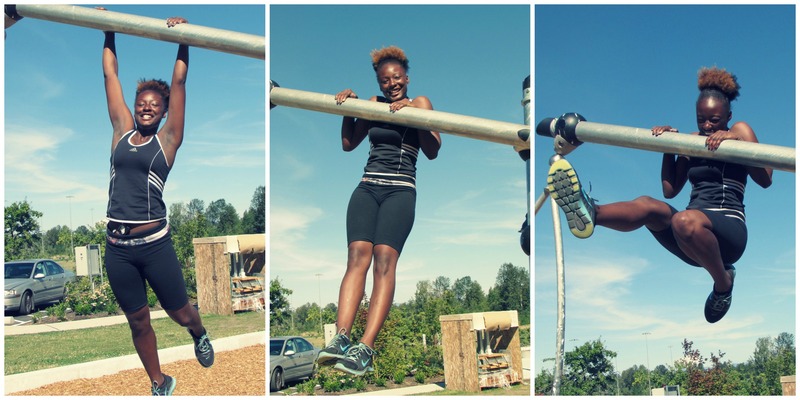 I had some trouble with the pull-ups but I managed to try it out and put myself out there,” says Andrea. Andrea started the program stepping onto a 12-inch box, but by the end of the program was jumping onto an 18-inch box! Deiosha says, “It made me reach higher for my goals. Because I’m very active, but I didn’t have a lot of upper body strength, so it made me push harder to try something new.” Like chest to bar pull-ups. “I had never gotten my chest all the way up so one day I did it and I was really excited.” Deiosha says excitedly, reliving the moment as she speaks. In order to create that positive attitude in class, instructors focus on creating activities that are inclusive of all levels of fitness and socioeconomic backgrounds. 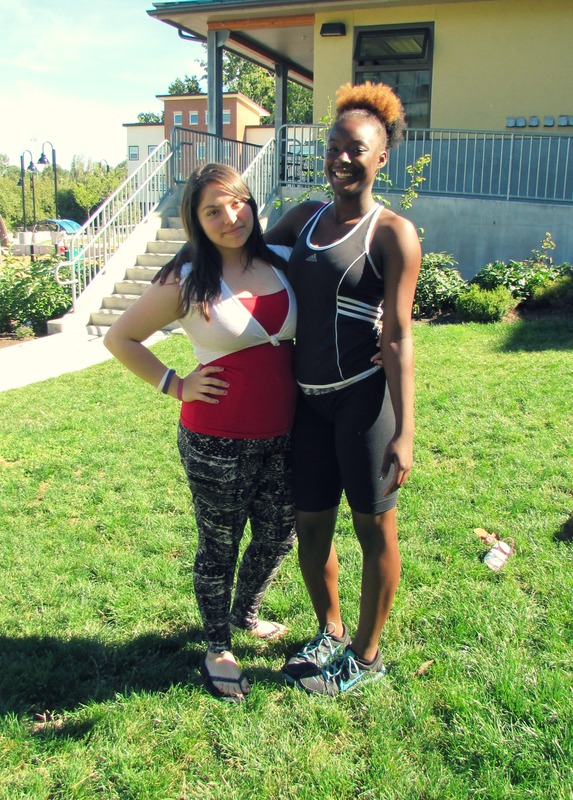 “For example, we held a Nutrition Challenge in the spring. Our nutritionist didn’t make it about shopping at Whole Foods, because not everybody can afford that. The first week of our challenge was to substitute water for sugary beverages. That doesn’t cost you anything; that actually saves you money!” Jill explained. Inclusion seems to be a common theme at Upower. Every new student is interviewed in order to get to know them and their ambitions, as well as any existing obstacles such as lack of workout attire, which is graciously donated to UPower by members of Northwest Crossfit (NWCF).“They feel normal when they’re not wearing ‘kind-of, sort-of’ workout clothes,” says Jill. The space is also donated by Jake Platt, NWCF owner. Because racism is a root cause of poverty, Solid Ground works to undo institutional racism both internally at Solid Ground and in the broader community. In this brief video, former Executive Director Cheryl Cobbs Murphy tells the story of how this nonprofit human services agency became committed to anti-racism social change organizing. Trained staff in Undoing Institutional Racism and cultural competency. Formed a multi-racial, staff-driven Anti-Racism Committee (ARC) to organize internally and identify and prioritize anti-racism actions to better serve our clients. Engaged staff and community members to recognize and take action against racism in our own lives and communities. In 2007, the Seattle Human Services Coalition recognized Solid Ground’s anti-racism work, presenting Executive Director Cheryl Cobbs Murphy the inaugural Ron Chisom Anti-Racism Award. Hear from the horse’s mouth, or at least from the dog on Waiting for the Interurban, about 40+ years of innovation, partnership, hell-raising and action to end poverty. Thanks to Fremont Brewing Company for creating a special 40th Anniversary Ale that will be on sale! When Community Action was launched through LBJ’s War on Poverty in 1964, weatherization programs were a key component of our work. 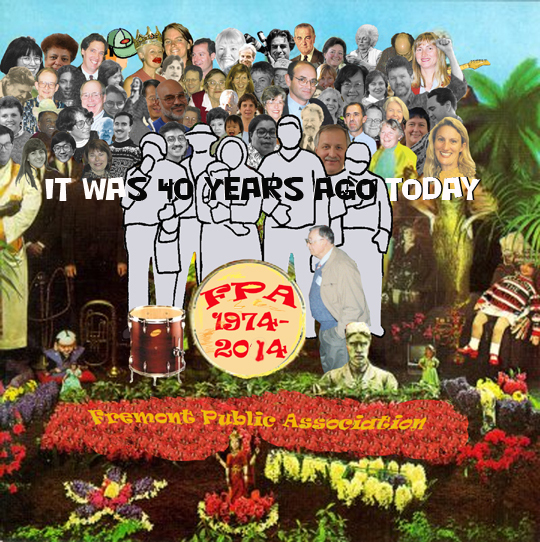 For many years Fremont Public Association (now Solid Ground) offered Minor Home Repair and weatherization services. 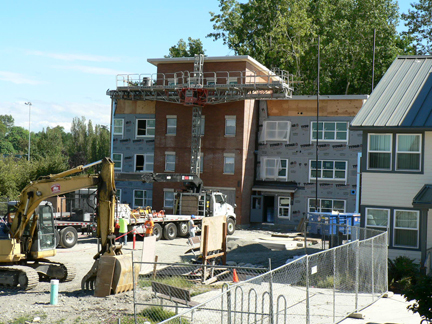 Now, we are delighted to be completing the first phase of preservation and energy updates to Santos Place, a former Navy barracks that provides transitional housing for 42 formerly homeless men and women at Magnuson Park. 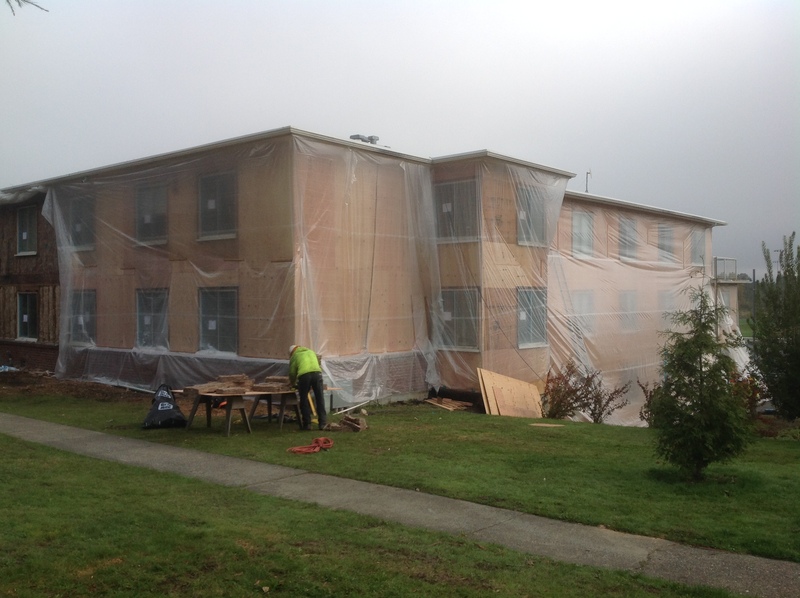 The scope of work includes installation of a new roof, insulation in walls, and new windows and siding. These improvements, along with a new boiler system, will generate about $25,000 in annual energy savings for the building and create a facility that is warmer in the winter and a cooler during warm weather. The first phase of preservation is funded by the Washington State Department of Commerce, City of Seattle HomeWise Program and Solid Ground. Ally Community Development is our developer, Environmental Works is our architect, and Walsh Construction Co. is our contractor. 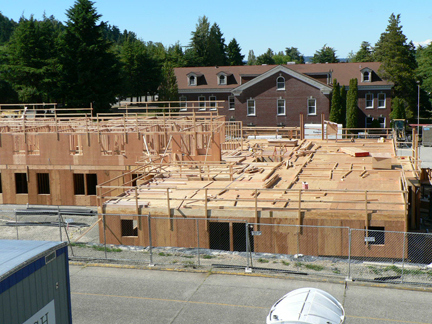 Sand Point Housing construction continues apace at Magnuson Park. 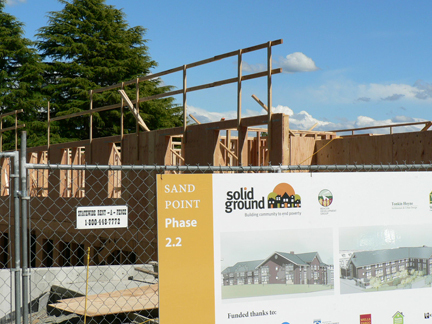 Solid Ground is adding permanent supportive housing for previously homeless families, single men and women. 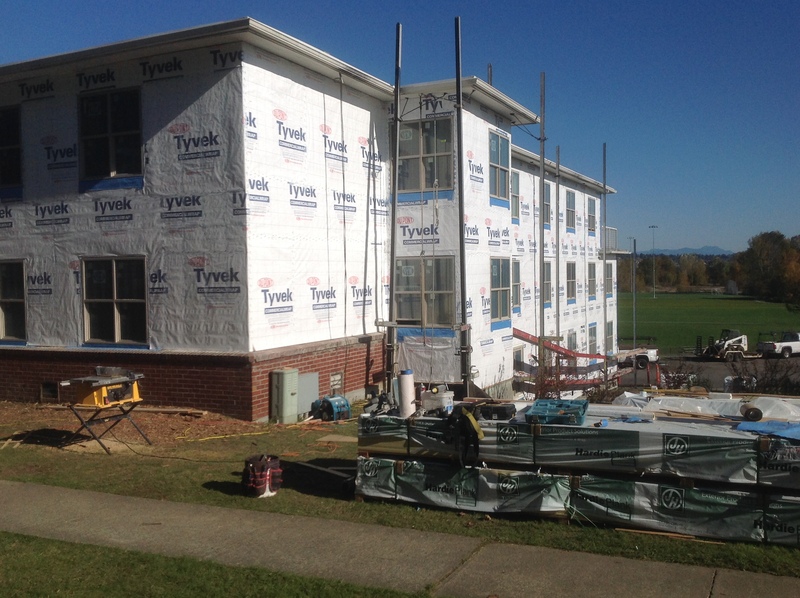 We hope to have the two new buildings complete late this year and leased up soon thereafter. 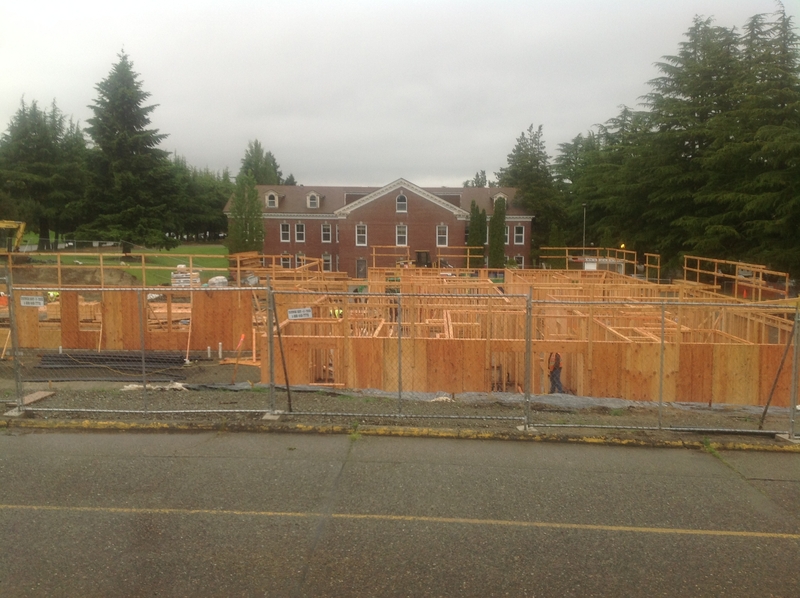 Framing of Building 5 along Sand Point Way. Building 4, nestled in the courtyard of Brettler Family Place. 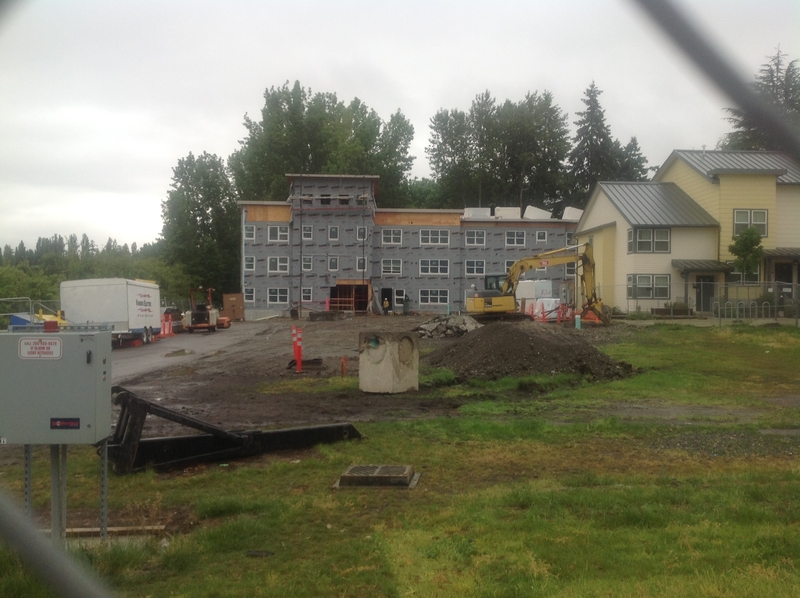 Building 5 takes shape south of the long barracks building on Sand Point Way. Building 5 from the balcony of the Lowry Community Center. 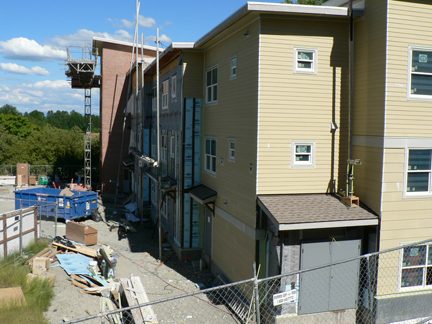 Once completed, the new facilities will bring to 200 the total number of homes at Sand Point for formerly homeless people!